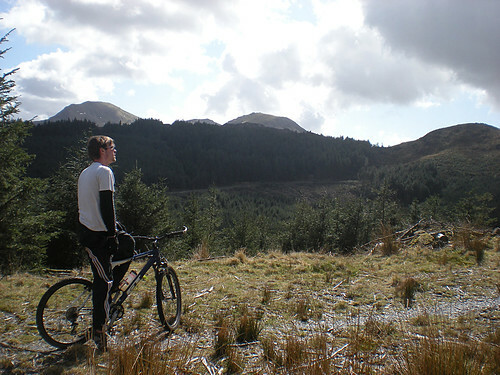 Beddgelert forest is a great place for a spin on a mountain bike. The Welsh village of Beddgelert is located in North Wales in the heart of Snowdonia. Snowdon is a few miles to the North East and to the North West of the village is the forest. It's not a huge place. 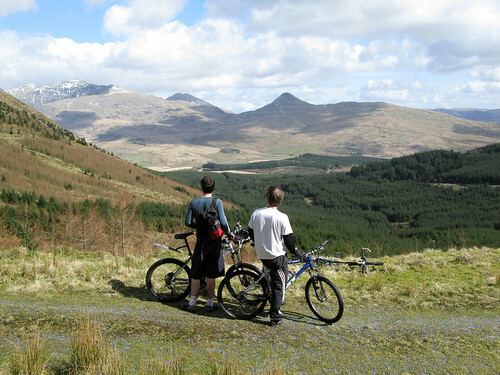 A decent circular route is about 12 miles – or a few miles more when cycling up from Beddgelert – but it's a thrill to ride full pelt from the top to the bottom. First you have to slog your way to the top. A network of tracks runs throughout the forest and junctions are marked with numbered posts. See the Beddgelert forest map. You work your way up to marker 38 at about 1,450 feet. Beddgelert is quite close to sea level – about 150 feet – so the climb from the village is about 1,300 feet, cycling upwards continuously. The first two photos were taken at marker 37. I've been cycling in Beddgelert forest for over 20 years, every Easter, and have developed a favourite route which combines as much climbing as possible with exhilarating descents that swoop down gradually back to the village without repeating any tracks. The whole ride takes an hour and a half, maybe. I used to do it on my own before breakfast but now I go mostly with my brother Martin, his partner Deborah, and my sons Robert and Nick. Some years I'm faster than Martin but the past two he's beaten me to the top. My sons, of course, are always faster. My old Peugeot ATB doesn't have suspension, which makes it efficient going uphill but slow going down. Deborah doesn't have suspension either; next year we might both be riding new MTBs with suspension forks. I'm conscious of the danger in cycling flat out downhill. The tracks are surfaced with slate gravel, often with a grassy strip in the centre and ditches at the side, lined with rocks. They sweep and curve gorgeously down through the conifers and as you crackle along you hear stones thrown up by the front wheel ping against the spokes on the back one. The sound of the wheels on the slate adds to the thrill, I think. Now and then the downward track rises over a brow and you power up for a minute or so before plunging down again, the bike slipping sideways round the curves, stones flying, but you choose your line, switching from side to side to stay on the gravel, occasionally flying over rocky bumps or splashing through pools of mud. Knowing the way means you whizz down 1,000 feet to the bottom of the forest without stopping, and when you get there you smile at the others and say: "Let's do it again!" 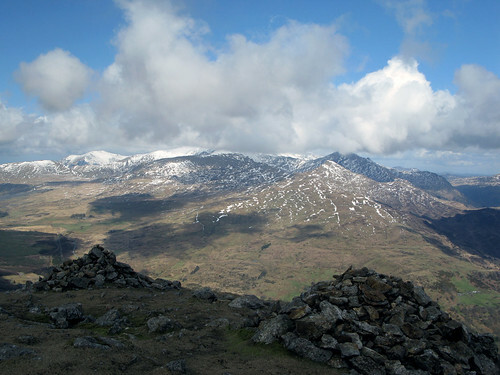 The last photo is taken from near the top of Moel Hebog, one of the best walks from Beddgelert. The views from the top are amazing. On one side is the Snowdon range and on the other is a clear view West over the beautiful Lleyn Peninsula stretching all the way to Abersoch and Aberdaron. Posted by Patrick on April 11th, 2010. Pure pleasure! 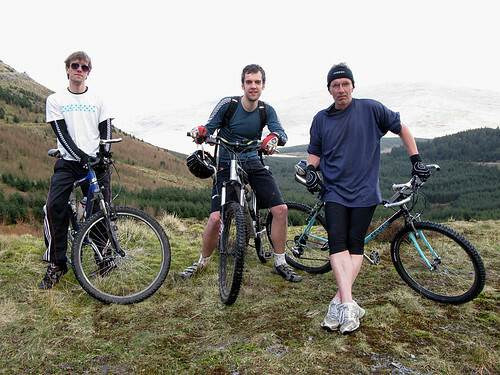 I love cycling off-road but none of my friends do. I'm always alone when I do it. That old Peugeot bike of mine is the only one I rode year-in year-out from some time in the 1980s right up to 2008 when I got my first road bike. It's actually an ATB, not strictly an MTB. Only the frame and fork is original and it has an old-style horizontal crossbar. Amazing it's still going (just about). I really need a proper mountain bike. You're right about pure pleasure off road. You have to think more, and you tend to experience more environments than you would otherwise, unless you're a walker. There's a lot of dirt of course, and cycling purists don't like dirt. WOnderful! Fantastic photographs. 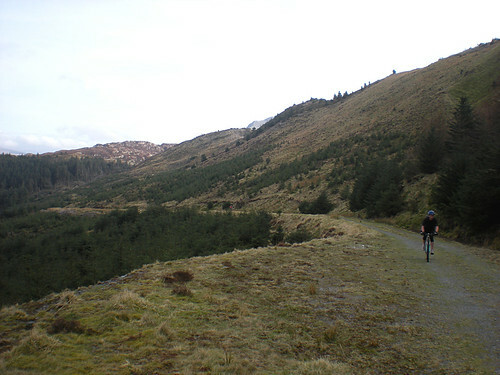 I am going on a mtb riding weekend in May with the Manx Mountain Bike ladies group, I hope its got this scenery to see. I used to work in the Snowdon National Park, and sort of know parts of the area well. I was saddened to see the Welsh Challenge ride has been cancelled for this year, I had a fancy to do that – its a road ride though not mtb. My off road C2C has also gone to the dogs due cost sadly. How do your arms feel with no suspension on your bike Patrick? I am very thankful that my mtb has front suspension at least. My arms are ok but I know what you mean. Strange to say, but I've never ridden a bike with suspension. I want one now though, having been with the others that have it. They float where I rattle and shake 😡 . As Sharpe (Sean Bean) would say: "It's iz bike Sir. Let down by the front foark." My 2010 LeJog is beginning to look shaky for cost reasons too, if I'm getting a new MTB this year. That trip is looking like 2011, especially as I'm too exhausted with planning Denmark to plan LeJog straight after. Wales is so beautiful and I love the fact that they (we) have a language. Great views, Patrick. Sad to hear your LeJog may be off, that would be a pity. So have you made a shortlist for the MTB? I don't know, Chris. Something like a Specialized Rockhopper. One of my sons has a friend who runs a bike shop so I might look there over the summer. They sell Giant bikes. Orange makes nice mountain bikes too. The main thing is whether aluminium or steel – aluminium probably, although the Orange R8 in steel is nice, but pricey. Maybe I could just buy a frame (£560) and build one up. 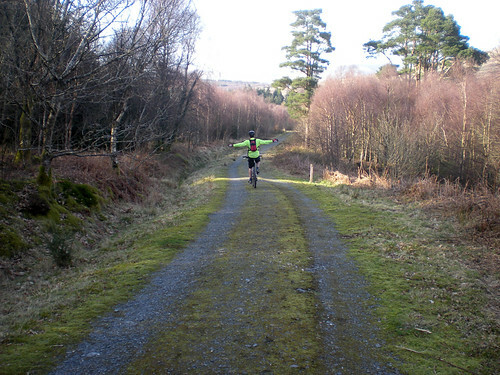 Myself and family used to ride the forest every Easter and New Year great place. As our son now lives in Llanberis we do some times still ride there great fun. We were there at Easter and rode twice with some great folk from the local CTC (rides on Sunday and Thursday very welcoming). I did manage a ride on my new Felt MTB (was cheap) but I had hurt my right thumb with a demolition drilling through a 3ft wall in his stone cottage. I found I could not put the thumb around the bars to break. Made more and interesting and fast ride down. The old MTBs are great I still have my chromoly lugged frame Claud Butler with canti brakes and love to ride that down Beddgelert Forest instead of the new one. My wife and I are going to Beddgelert next week, Monday 9 Jan 2012 for a few days in our VW Campervan, Gladys. We've been there before and have enjoyed it so much. We now have a dog, Amber, a Border Collie and we are looking forward to taking her for long walks around the forest, also hoping to try her out with us on our bikes. Let's hope the weather behaves itself.